Thank you. They look fantastic. Pity I can’t recreate them. Is the kitchen table blackwood? - I love the natural tones used. What is the wood in the table? Hi Esther, the dining table is solid ash - it's the Mika Table from Globe West, which you can view HERE - have a great day! Hi there, of course, they're the Mica dining chair from Globe West - although I'm not 100% sure that they're still stocked. Good luck! Beautiful! Could you tell me where your kitchen pendants came from? kitchen benchtop - Love your benchtop. Please could you tell me what it is? And is it honed or polished? 30. 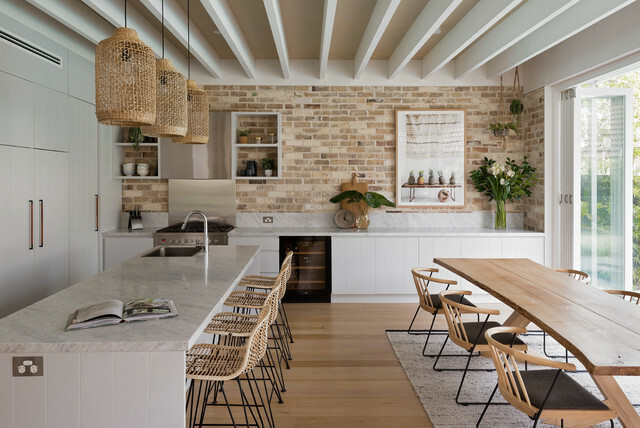 Location: Cammeray, NSWDesigner: Studio 1 InteriorsFeatures: Timber, cane, brick and white – the tones and textures team together beautifully.Tell usWhich kitchen-dining set-up do you like best? Tell us why in the Comments. And don’t forget to save your favourite images, like the story, and join the conversation.More Did you miss last week’s Best of the Week on dynamic displays of collectibles and art? 14. Location: Cammeray, NSWDesigner: Studio 1 InteriorsFeatures: Texture and soothing tones make this kitchen ultra-inviting. 26. Location: Cammeray, NSWDesigner: Studio 1 InteriorsFeatures: Texture and soothing tones make this kitchen ultra-inviting.